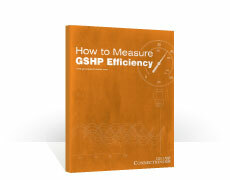 We recently added a new guide to the Geo Bookstore about How to Measure GSHP Efficiency for Forced Air Units. The guide is designed for homeowners that are as geeky as we are and like to keep logs of performance data on their installed equipment so that they can bask in the piles of money their geo system is saving them every winter. This isn't the kind of thing that everyone should be doing on their own but for those that are confident in their ability to use a multi-meter and an ammeter clamp this step by step guide will walk you through the measurements that need to be taken and the calculations you'll need to perform to find your heat pump's COP. IMPORTANT NOTE: A single bad measurement is not indicative of a problem. If you are worried that your system is not working properly, you should always call an installation professional. MORE IMPORTANT NOTE: To take these measurements you will have to deal with electrical connections inside the heat pump cabinet. Do not try this at home if you wouldn't be comfortable wiring a plug (single or three-phase).